Antique chair casters serve a useful purpose while adding a little something extra to a chair. Like a piece of jewelry on a little black dress, they add that elegant finishing touch to a chair. They can add value to the piece and they make it much easier to move the chair from one place to another. A caster is a small wheel that has the ability to swivel that gets attached to the bottom of furniture legs, making them easier to move around. Traditional period styles include casters with brass wheels, porcelain wheels and wood wheels. Aesthetically, brass casters and claw feet provide a graceful and sophisticated end point to chair and table legs. Casters are a great addition to antique chairs because they help protect the chair legs and keep them in good shape. When chairs are dragged across the floor it can cause the joints between the legs and the seats to become loose. Wheeled casters eliminate this problem. The added height and swivel mobility also provides additional flexibility to furniture. They also help protect the floor underneath. Dragging chair legs can scrape hardwood floors, but wheeled casters will not. Even with these guidelines it can be difficult to date casters because there are so many reproductions on the market. They're often done in antique styles so they look very similar to genuine antiques. Also, furniture casters frequently get replaced so a period antique chair might have a newer caster on it. The age of the chair is not necessarily indicative of the age of the caster. If you're looking for casters to add to an antique chair, finding ones that match can be essential to completing the style and décor of the chair, and thus the room. 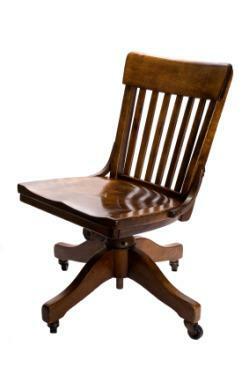 Putting a modern caster on an antique office chair will look odd and out-of-place. Check out stores that sell antique hardware to see if you can find something that compliments the piece. Sometimes you can find beautiful old brass casters at vintage and secondhand stores. The Internet is great source for antique furniture parts and hardware. Type "antique casters" into a search engine and you'll get a list of places tailored to your location and beyond. Have a look at all the different sites and see what strikes your fancy. Compare prices and think about what will work best for you. Some examples of sites to check out are Paxton Hardware, Caster City, and House of Antique Hardware. Another great online source is Ebay. Antique chair casters are very elegant and can add the perfect finishing touch to your vintage or antique chairs. They look great and they're also very practical. They can protect the chair as well as the floor beneath it.